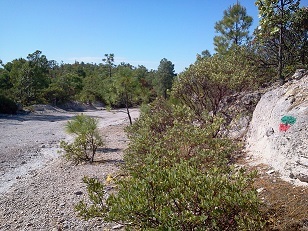 This section of the Camino (6.1 kilometers, 2.0 hours) leads from the El Chepe crossing (after the Old High Road) to the largely Tarahumara village of Pitorreal. Pitorreal serves as the “half-way point” of the Camino hike (36 kilometers from Creel, and 22 from Divisadero). It is also approximately half-way on the Creel-Divisadero highway (26 kilometers from Creel and 18 kilometers from Divisadero by Highway 77). 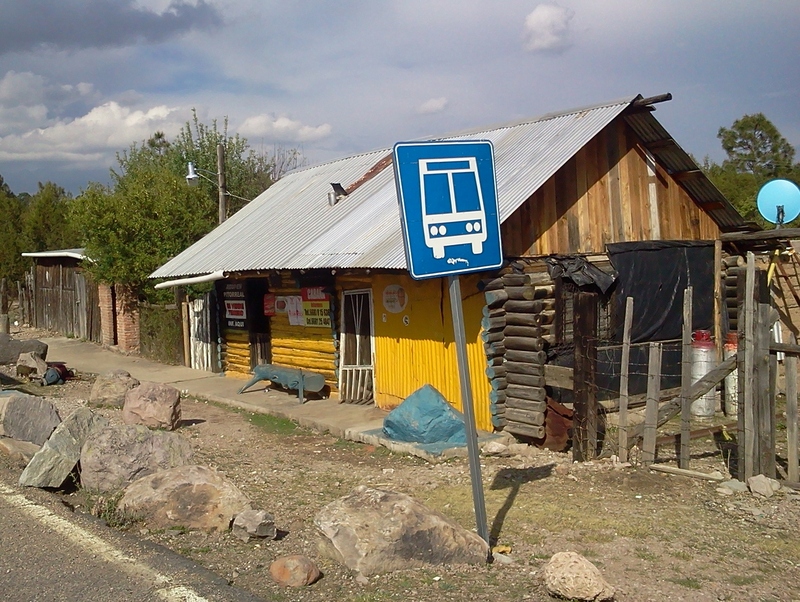 It is also the only stop on the El Chepe train between the two tourist centers, and also a bus stop with several small stores for basic provisions. 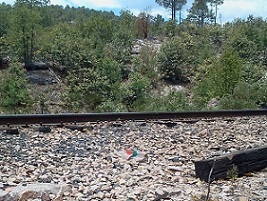 he starting point for this section of the Camino is the short straight section of Highway 77 where it crosses the El Chepe railroad. Due to a series of “speed bumps,” vehicles must slow down to very slow speeds to cross the tracks. As a result, after arriving directly at the crossing at the end of the previous Section 7, it is relatively safe for hikers to cross the highway at this point. 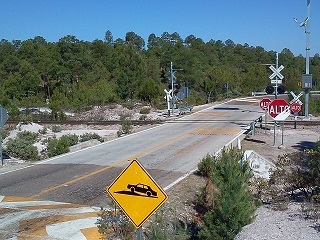 The trail passes into a large flat sandy area where maintenance vehicles working on the crossing may park. This parking area is between Highway 77 and the railroad. The Camino turns away from the railroad and crosses the open area, generally following the highway to the left. In 50 meters it enters a forested area at the south and east edge of the parking area. 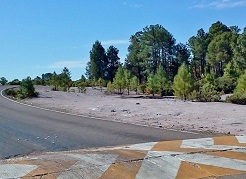 A short sandy wash leads to the point where hikers cross to the east side of the highway. The crossing point is approximately 250 meters from the railroad junction. A dirt road with a gate leads away from the highway, but the Camino makes a hard right turn after the gate and continues parallel to the paved road for ¬¬¬600 meters. Highway 77 remains to the right (west). The Camino follows the route of the water pipeline up the hill over rough, often rocky terrain with few trees. Hikers must watch for markers on rocks and on small trees. There are good views (partially obstructed by trees) as the trail rises 25 meters to the top of the hill. It is separated from the highway by a small (5 meter) hill on the right. From the high point the Camino follows the road around to the right to intersect the highway once again. Just past the high point (looking left) hikers can see the small white bus shelter with a red-orange roof on the opposite (west) side of the highway. Behind the shelter the views over the upper canyons (Oteros Canyon, for example) to the West are good. The Camino turns left before the highway and continues parallel to the pavement for another 25 meters before crossing the highway onto the parking area for the bus stop. The shelter is clearly a good point to catch buses to the South (also to the North). In addition, it could be a good “break point” (sheltered against sun or rain) for hikers to take a rest with good views over the remaining terrain to the West and South. The Camino leaves the bus stop to the South into the short trees and manzanita bushes close to the highway, which is on the left. In this upper part the trail itself is faint, and hikers must follow the Camino markers carefully. It descends gradually from the shelter’s parking area on a cross-slope path (downhill side on the right) through the trees to the tracks. It crosses the tracks and continues with the tracks (and the highway) above on the left. At this point the trail is more evident as it descends through the trees to yet another old logging road where it makes a hard left turn up the hill. After 50 meters, the Camino makes another 90 degree turn (this time to the right) and follows a good forest path across the slope for 500 meters (downhill and views on the right). 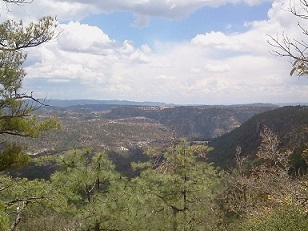 It drops slightly to meet a large dirt road that leads to the Oteros River and (as of 2016) access to the gas pipeline. At this intersection the Camino turns 90 degrees to the left and steeply ascends the dirt road to Highway 77. At the end of the dirt road, the Camino crosses the pavement and quickly crosses the tracks as well. Both the highway and the railroad have switched to being on the right side of the Camino at this point. The crossing is approximately 3.0 kilometers from the start of this section. The trail descends relatively steeply through the trees, across a water course, and then ascends through the forest back to intersect the railroad. After crossing the tracks (which continue on the left), the Camino rises somewhat steeply for 100 meters to the top of the Pitorreal mesa. At the top there are canyon views over the East and below to the railroad tracks as El Chepe winds its way around the mesa back to Pitorreal. 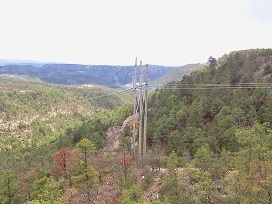 A power line (with large towers) also crosses the Camino at the top of the ascent. The trail continues 150 meters with views on the left before once again re-entering the forest along a fence line on the left. The sounds of Highway 77 become more evident as the Camino approaches an intersection with the highway on the right. At the intersection with Highway 77, the Camino turns left onto a flat country road lined with trees and between two fields and fence lines. 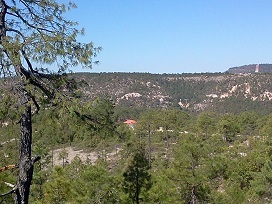 After 200 meters several Tarahumara farm houses come into view on the left on the other side of the left fields. An interesting stone building on the left is a community well and pump house. Shortly after the pump house the Camino proceeds straight into the forest on a clear narrow road. However, hikers may add a short “side trip” by turning left at their discretion to walk 50 meters to the edge of the mesa for good views of canyons to the East. After 200 meters in the forest at roughly 5 kilometers from the start, the Camino turns hard right and continues in the forest toward a fence line. It follows the fence for 150 meters until emerging into a network of trails. Fortunately, in only 20 meters, it turns left at an intersection with a country road. 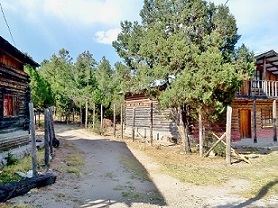 Following this road as it winds through the forest and beside Tarahumara farm fields, Camino hikers enter Pitorreal in 200 meters on the north side of the village past some typical wood and log houses. The village is 6 kilometers from the start of the section. 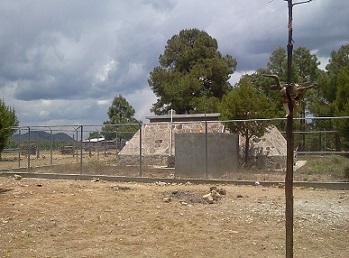 Pitorreal is a small village (largely Tarahumara) of approximately 75 houses widely dispersed over the mesa, some abandoned, others inhabited only part-time, some new, others old. In addition, there are a number of fields for corn and beans, cattle and other agricultural products. 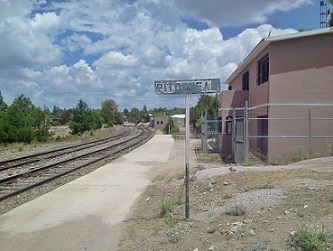 The railroad has now completed its long south-eastward loop and has entered the pueblo at the Pitorreal train station. The station (now in a state of disrepair) is only 50 meters from the Camino on the left, behind a number of buildings. The Camino winds through the pueblo past private houses and the Pitorreal primary school with its covered play area. 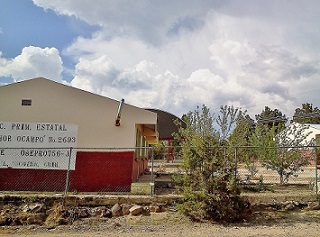 After passing the school on the right, the Camino turns sharply right to join Highway 77 at the bus stop with its accompanying small shop. There are three other small shops elsewhere in the town. 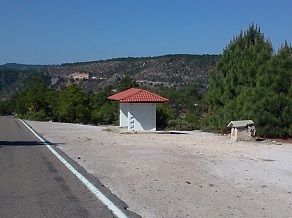 Pitorreal is the final point on this section of the Camino (6.2 kilometers from the starting point). As noted, hikers can catch the bus to either Creel or Divisadero from this stop. Alternatively, with enough planning, they can catch the train (also to either Creel or Divisadero).